National Committee to Preserve Social Security & Medicare argued in a 2017 paper. Urban workers spend 7% of their household income on medical costs, but older adults easily spend 15% or more, Johnson said. “That’s one of the fastest, if not the fastest cost they’ll have in retirement.” The Senior Citizen’s League estimate also does not consider any adjustment to Medicare premiums, which could rise this year as well (premiums didn’t rise last year). For retirees receiving a Social Security check and paying their Medicare premiums, COLA would be absorbed by any increase in Medicare premiums higher than the adjustment. Medicare premium hikes can’t reduce Social Security recipients’ benefits, but it can make any adjustment for inflation obsolete, said Howard Pressman, a financial adviser at Egan, Berger & Weiner in Vienna, Va. Medicare Part B premiums may perhaps be the steepest health care expense for Americans over 65 years old, Johnson said. The cost has jumped 195% since 2000, from $45.50 to $134 a month today. As States Try To Rein In Drug Spending, Feds Slap Down One Bold Medicaid Move States serve as “laboratories of democracy,” as U.S. Supreme Court Justice Louis Brandeis famously said. And states are also labs for health policy, launching all kinds of experiments lately to temper spending on pharmaceuticals. No wonder. Drugs are among the fastest-rising health care costs for many consumers and are a key reason health care spending dominates many state budgets — crowding out roads, schools and other priorities. Consider Vermont, California and Oregon, states that are beginning to implement drug price transparency laws. established a Medicaid spending drug cap. In late June, Oklahoma’s Medicaid program was approved by the federal Centers for Medicare & Medicaid Services to begin “value-based purchasing” for some newer, more expensive drugs: When drugs don’t work, the state would pay less for them. But around the same time, CMS denied a proposal from Massachusetts that was seen as the boldest attempt yet to control Medicaid drug spending. decisions. As part of this process, we will be releasing consumerfriendly education tools and policy analysis in the coming weeks on the anticipated changes to MA plans, beneficiary tools and resources, Medicare and the opioid crisis, and Medicare enrollment periods. We also remain actively engaged in the implementation of these regulatory developments, to ensure the beneficiary perspective is considered and embedded in any changes to the program. We recognize that some of the new policies may not ultimately benefit people with Medicare, and we will continue to monitor the use and potential abuse of these new rules. Read the CMA issue brief. 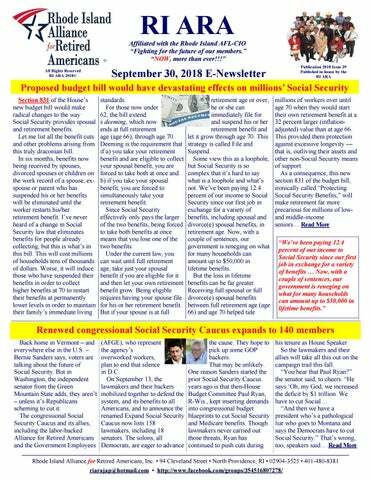 misinformation when they tried to obtain it.” Medicare Rights urges people who may be eligible for this relief to apply by the current September 30, 2018 deadline and to contact our National Helpline with any questions or concerns that may arise. For more information on time-limited equitable relief and how to apply:  Visit Medicare Interactive, the Medicare Rights’ free online counseling tool  Read the Fact Sheet made available by CMS  Call the Medicare Rights’ free national helpline at 1-800-3334114  Find your State Health Insurance Assistance Program (SHIP) at 1-877-839-2675 or by going to www.shiptacenter.org  Contact the Social Security Administration at 1-800-7721213, or go to socialsecurity.gov, or visit your local Social Security office .......Read the letter. surprise. "As a society, we don't typically think of persons in the grandparent generation as having opioid use disorder," she said. But when common chronic pain is paired with "the generation of physicians that were taught that opioid medication, when used for pain, was not likely to become addictive," the result is a senior citizen opioid problem. And, Everett said, the problem is likely more acute among the rural and the poor, who "often are in situations wherein they have fewer resources, less alternative treatments and may not know about the chances of becoming addicted to a prescription medication." Shame, stigma and social isolation among older people may also complicate efforts to prevent addiction or tackle it when it occurs, she added. The solution? Everett suggested that caregivers have to be educated about the risk. "SAMHSA supports early training for all health professionals so that addiction can be avoided, identified and treatment offered as early as possible," she said. There's more on opioid treatment among seniors at SAMHSA. Heart valve 'clip' shows promise for heart failure patients A tiny new device is offering hope of a better life for people with severe heart failure, reducing hospitalization rates and improving mortality risk within two years of treatment, a new study finds. Heart failure affects an estimated 5.7 million Americans and more than 26 million people globally, causing shortness of breath and tiredness among those affected as their heart struggles to pump blood around the body. Does Smoking Cause Dementia? From heart disease to cancer, smoking comes with a range of health risks. And researchers have warned dementia shouldn’t be left off that list. Scientists based in South Korea made the link between smoking and dementia by studying 46,140 men aged at least 60, who were registered to a population-based screening program from 2002 to 2013. Participants detailed their smoking habits on a questionnaire completed between 2002 and 2003, and again in 2004 and 2005. Dementia: The Journal of the Alzheimer’s Association. Kevin Matthews, a health geographer and lead author of the study with the CDC’s Division of Population Health within the National Center for Chronic Disease Prevention and Health Promotion, said in a statement early diagnosis is key not just for patients, but for caregivers who need support. "It is important for people who think their daily lives are impacted by memory loss to discuss these concerns with a health care provider," he said. wrote. Since belly fat is such a persistent issue for people, both for aesthetics and health purposes, there's no shortage of belly-fat-related content and recommendations on the internet. But it's important to be discerning with the information and stay up to date with the latest research. If you're looking to lose weight and target belly fat, it's best to talk with your doctor or a registered dietitian to find the best diet for you. inconsistent about the benefits of vitamin D levels [in] breast cancer," she wrote in Menopause. "This study and others suggest that higher levels of vitamin D in the body are associated with lowered breast cancer risk," Pinkerton says. But regardless of their cancerfighting properties, taking that long sunny walk outside (again, with SPF) and chowing down on vitamin-D-rich foods like salmon, tuna, mushrooms and eggs will only make you healthier, so go to town.